I just cracked open a bottle of Evan Williams Single Barrel 1998. I'm usually a rum drinker (this and Booker's are the only bourbon I've got), but this was a darn good bottle of booze. The nose reminded me a little of sum of my rums, was just a little sweet, very smooth (one ice cube), good combination of caramel and wood flavors. I'm a fan. Knob Creek pairs best with my fascination for full-bodied maduros! That's good to know, I just finished a bottle of the 1997 and as soon as it's on sale, I will buy another which will probably be the 98. Just picked up some Eagle Rare 10yr at the store, I can't wait to crack into it. Makers Mark is my current favorite, but I like these too. Can anyone give me a quick review of the Elmer T? I've heard good stuff but never tried it. It seems to slightly harder to find around me. 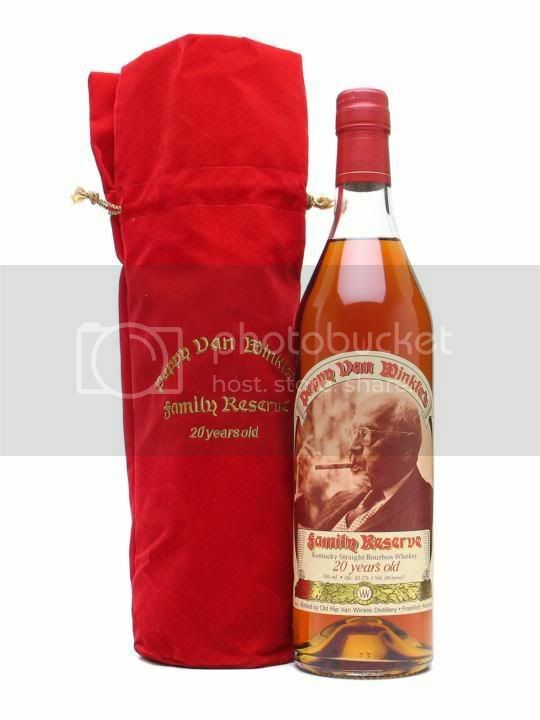 I do enjoy almost anything the buffalo trace distillery puts out though I have been wanting to get my hands on some. Had some last night over ice. Although, a few of theses are not bourbons, I found this to be interesting. I found it while surfing. It's a list of the top ten whiskey's that everyone should try! I have had #9 and #10 and loved them both! I have not tried any of the others. Have you tried any of these? #10 - Wild Turkey American Honey. If your throat’s burning and you’re craving something sweet, try this honey-laced bourbon from Lawrenceburg, Kentucky. Ashley Judd not included. #8 - Jameson Rarest Vintage Reserve. Regular Jameson on steroids, metaphorically speaking. Only 1,300 3-liter cases came out for the first vintage, which means you had an easier time getting the first copy of the last Harry Potter book. #7 – Nikka Yoichi 20 years old. So it’s not from Ireland or Scotland. Japan’s an island, too, and in a 2003 blind taste test, this Asian single malt gave the Gaels one in the eye. #6 - Suntory Hibiki 30 years old. Yet another entry from the Land of the Rising Sun, this whisky was declared the “World’s Best Blended Whisky” at the 2008 World Whiskies Awards. Boy, first it was cars, now it’s booze? #4 - Glenrothes 25 years old. Another limited edition single malt, though with 2,400 bottles released upon an unsuspecting world, you may want to ask Glenrothes if they really know what “limited” means. Each bottle of this whisky contains spirits distilled in 1967, 1972, 1977, 1979, and 1980. Guess that’s what’s really going on when you save time in a bottle. #3 - Blue Hanger 30 years old. The name has nothing to do with Joan Crawford’s closet fetishes and everything to do with an 18th century whisky lover who liked to wear blue. Gee. Suddenly all those frequent customer points seem so hollow, don’t they? #2 - Glenfiddich 40-year-old. Only 600 bottles were filled from the casks first laid down in 1963. If you have to ask the price, you probably can’t afford it. It’s earned enough gold medals to be served to Michael Phelps. #1 - George T. Stagg. The pride of Buffalo Trace Distillery of Frankfurt, Kentucky. You can’t go wrong with a Bluegrass state bourbon, and if you’re willing to plunk down the bucks, George T. Stagg deserves a place on your rack. Not sure how this list wass put together as it is all over the map. The Dalwhinnie 15 is definitely good but there are plenty of other scotch whiskies at the same price point I would choose over this one. The Compass Box Hedonism is very good and worthy of trying. I don't think it is worthy of the asking price but definitely something interesting to try. The George T Stagg is an exceptional bourbon and one of my favorites. Each year Buffalo Trace releases a new George T Stagg around this time of the year. The sell quick so go buy NOW! It is straight from the barrel, unfiltered (YUMMY) and hovers around 140 proof depending on the year. Others that BT release each year are William Larue Weller (wheated bourbon = YUMMY) and Thomas Handy (straight rye, barrel proof & unfiltered = REAL YUMMY). I would buy all three of these for sure!!! Always welcome, bring your Zaya. I just can't do it straight. Gotta admit i was thinking the same. Get as mad as you want, but I am at it again tonight. Hey, at least I don't cut my churhill's in half. Neat, neat, neat. That is all. For the price I really enjoyed Old Forester. Not bad at all and only a little over $25.